All breakage is not preventable. Our hair wears and tears with everyday life, but that doesn't mean everyday detangling is okay. Excessive manipulation via detangling and combing leads to more breakage than necessary -- whether it be from hygral fatigue, worn down cuticles, or just mechanical stress. Hair without a white bulb on the ends (regardless of length) is breakage. Seeing more bulb-less wisps of hair than not? Time to change up the routine. 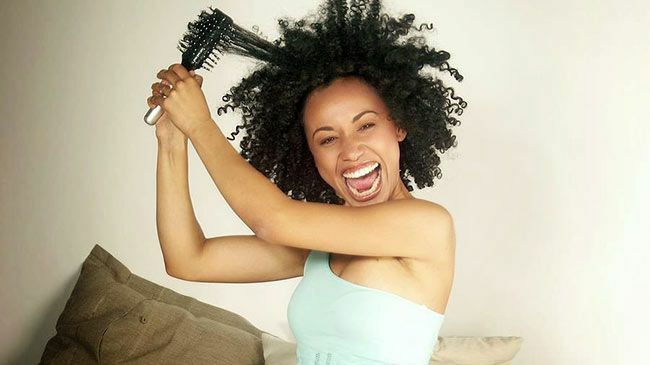 Even if your hair isn't breaking excessively, chances are with every tug of a finger detangle, or move of a comb, you're uprooting hair that isn't ready to leave your scalp yet. Shed hair that has left your scalp and needs to be freed from entanglement will always have a white bulb on the end. Have you ever encountered a hair that had a dark brown or blackish bulb at the end? That's a hair that was plucked directly from your scalp before it was ready to go! Everyday combing and detangling increases the likelihood of removing hair from your scalp that could still be well, hair on your head. Over time, hair may appear thinner and if done excessively, can cause trauma to the follicle to the point where hair will not regrow. The painful truth here is that there is no right answer. Just like detangling methods (wet, dry, damp, oil-only) and tools (fingers, comb, Denman), the frequency with which to detangle is totally individual and only found through trial and error. Generally speaking, shorter TWA length hair of any texture, and looser curls and waves can be detangled more frequently without as much concern for adverse consequence. But for those looking to retain maximum length, or that are on a growth journey, less is always more. I typically detangle and wash my hair every 4 to 6 days because I have scalp psoriasis and I work out regularly, so I need to remove sweat and dirt from my scalp. I have found that this works for my hair. Some detangle weekly and wash monthly. It's up to you, and what your hair can handle. But for most textures, I would recommend not detangling more than twice a week. Overstepping this occasionally won't wreak havoc on your hair. But remember what we discussed earlier? Too much of anything is bad for you and your hair. One last thing to take into consideration before your next detangling session is: that our hair never fully detangles. Our kinks, coils, and curls looooooove each other so much that they'd rather buddy up together than remain apart. This is the main reason why many naturals wash and detangle their hair in sections, and twist or braid each section up as they go along. So even if after 2 hours your hair isn't 100% tangle-free, that's okay. We're never going to get each and every single tangle out of our hair -- it is an impossible task. So save yourself some time, a few broken hairs, and a heap of conditioner by aiming to have your hair between 80 and 90% detangled each time. Christina Patrice is NaturallyCurly.com's resident 3C product junkie, who documents her healthy hair journey through her blog, ManeObjective.com.